Is your mahogany ethically sourced? Yes, our manufacturers use medium grade mahogany timber sourced from forests that are part of regeneration programmes. These managed forests are strictly controlled and it is a legal requirement for all exports of timber products from Indonesia to the EU to comply with SVLK certification. Our furniture is all constructed from legally harvested wood. I require something in a different colour or size to that shown. Many of our products are available in different colours and sizes - please ask us if you require a colour/size that is not shown as we may well be able to supply it. With our wide range of suppliers we can accomodate many requests! We also offer a Bespoke range which can be finished in the colour/colours of your choice. Most pieces in the bespoke range can also be made to a non standard size if desired. Many other pieces can be repainted in the colour of your choice - just ask us for a quotation. All of our reproduction furniture is delivered either by a dedicated furniture carrier or courrier for our smaller items. The service charged for is for ‘to the door’ delivery. Moving furniture into the room of your choice would be solely at the discretion of the driver. Items delivered beyond the threshold of your property (ie. upstairs) are at the property owner’s risk. Please see our delivery terms for further information. Yes. We can arrange delivery almost anywhere, but our web site shopping cart currently only calculates deliveries for the British mainland and excludes the Highlands of Scotland. We can deliver at very competitive rates to Northern Ireland / Eire and we are happy to quote for export to Europe, USA and Worldwide – please give us a call. What happens if the furniture doesn't fit my room once it arrives? This subject is also covered in our delivery terms which we recommend all our customers to read. Please ensure that the furniture you have ordered will fit into your home. We will need good access for delivery, particularly for large items, and the responsibility is entirely with the customer as to the suitability of the size of the furniture once in position. We regret that we are unable to take furniture back if the size proves unsuitable. We do supply measurements for each piece to help our customers but please do check with us if you are unsure or need anything clarified. All of our furniture is hand made, so some minor variations in size can occur but, of course, this will only be minor and will meet accepted industry standards which allow a maximum of +/- 2cm, but are usually much less. We reserve the right to apply a restocking charge plus the delivery cost for any items returned due to this situation - see our delivery and returns policy for full details. In any case, all made to order / bespoke items cannot be cancelled under any circumstance. Exactly what colour is Antique White / Shabby Chic? Our white furniture is finished in an antique white style which brings out the detail in the carving and is best described as a cream colour. This gives the furniture a slightly aged appearance as opposed to a 'clinical' white. The process is applied by painting white a finished piece of furniture and then applying a coat of antique wax and polishing it off. This process is then repeated several times in order to get the desired finish. Exactly what colour/shade is your mahogany finish? 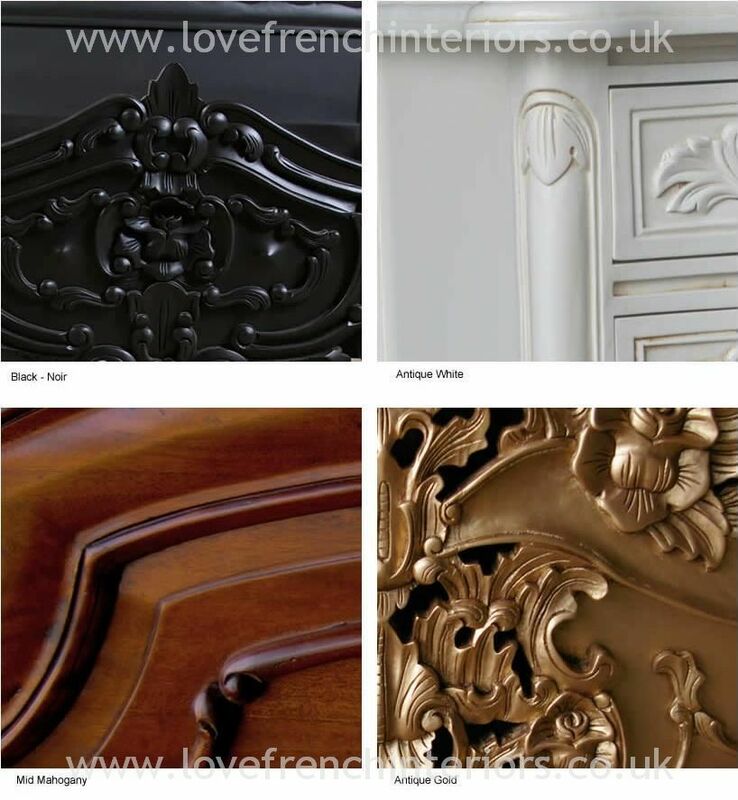 Our mahogany furniture comes in one finish/colour – that is mid mahogany also known as medium/dark honey mahogany finish. It is the shade most commonly found on mahogany antiques. Every effort is made to ensure that all pieces of furniture are matching although the hand finishes on natural wood products may have slight dye, shade and grain variations. If present these will be minor and to industry accepted standards. The appearance of the photographs on the web site may vary in colour but this is due to the different light conditions in which the furniture was photographed. Not all pictures were taken on the same day or in the same place so the level of available light will increase or decrease the shade of colour. Also, the monitor you are using will also cause a variance in shade. A TFT or laptop will generally show colours as being a little paler than a CRT monitor. If you do find that a piece is too light it is possible to stain the colour darker if care is taken. We recommend the use of antique waxes as opposed to stains as they allow a more gradual darkening. Do you use solid wood or veneered on your furniture? Our furniture is mainly solid wood (primarily mahogany and oak), although in a limited number of pieces (when there is a risk of warping on flat surfaces) veneered timber or medium density fibreboard may be used on larger panels to ensure complete stability in all environments. All the timbers are selected and kiln dried (to prevent splitting or warping) prior to manufacture by hand. Each piece will vary slightly as a result of being hand made but this adds to its unique quality.The hand made process reproduces the craftsmanship and attention to detail usually only found on original antiques of the 18th and 19th Century. We believe in the traditional manufacturing process which uses wood screws, dovetails, tongue and groove joints and other time proven joints which result in a finished product of premium quality that will last for many years to come. During the finishing process the wood surface undergoes several stages including sanding, filling and distressing and is then finally sealed by painting, staining, or lacquering in order to protect it against splitting or cracking. This detailed process results in pieces of exceptional quality that simply need a light dust or polish in order to stay in perfect condition for many years to come. How should I look after my mahogany furniture? Our sealed furniture (with a non shiny lacquer) only needs minimal attention to keep it in perfect condition – a simple light polish (non silicon based) and the occasional dust with a soft, clean cloth. However, we do strongly recommend keeping furniture away from direct heat sources such as fires and radiators which could cause distortion of drawers or in severe cases the warping of tops. All the furniture is made of real wood so extreme heat can be a risk as can direct sunlight which can cause paint fading. Our furniture with a waxed finish simply needs an occasional wax in order to keep the shine and provide some UV protection. It is a question of individual preference as to how often the wax is applied as the more frequent the application the more brilliant the shine will be. What are the bed slats like? Our bed slats are made of unstained mahogany taken from substantial cuts of timber. They are not flexible, and are designed to provide a firm platform for either a mattress and/or a bedbase. With each bed we usually supply about twelve slats and two rails which run from the headboard to the footboard which support these underneath. The number of slats may vary from one design to another, but in all cases the result is a very strong structure once the bed frame is assembled. It’s not essential (and is purely a matter of personal choice) but for your increased comfort, and to increase mattress longevity, we do recommend a bed base which fits on the slats and below the mattress. Alternatively, if you have a thick mattress you may find a bed base unnecessary. What are Hard & Soft woods? The most common and popular softwood is pine whose colour and density vary according to which part of the world it originates from (Europe or South America). It is has always been fashionable but is being replaced by hardwoods such as Oak and Ash. It can be sanded and shaped, stained and painted and is fairly cheap. Its main disadvantage being that it dents and marks easily. Hardwoods such as Mahogany, Teak, Oak, Ash and Rubber wood are often tropical in Origin and are always expensive. Oak and Ash are increasingly popular hardwoods and are more expensive than both pine and rubber. Extremely durable and hardwearing they are increasingly present in both solid woods and veneers (as a thin laminate applied to the top of furniture eg. dining tables to give a uniform and patterned appearance). Mahogany is a tropical wood that is naturally orange-red in colour. It is the ‘King’ of cabinet woods as it holds its shape very well once it has been correctly dried. Its fine grain is easily worked with edge tools and the grain is neither too hard, too soft, nor too brittle. What are the different types of Joints commonly used? This is a very strong joint because of the way the ‘tails’ and ‘pins’ are shaped. This makes it difficult to pull the joint apart and virtually impossible once glue has been added. This type of joint is used in box constructions such as drawers, jewellery boxes, cabinets and other pieces of furniture where strength is required. There are different types of dovetail joint and when cut accurately they are both impressive and attractive. Tongue and groove refers to a method of joining strips of wood. Each strip has a deep ridge or “tongue” and a slot or “groove” on the opposite edge. Two or more strips can then be pushed together closely to provide a secure and smooth joint. This is especially useful in drawer bases whereby the base will not bow and fall out or break with heavy loading – as is often the case with hardboard bases and sometimes even with plywood. Tongue and groove is also often used to finish wardrobe backs. Here again its strength improves the overall stability of the unit. A finger joint or box combing or box joint is a woodworking technique used to join two pieces of wood at right angles to each other. It is very similar to a dovetail joint except that the pins are square and not angled and are usually equally spaced. The joint relies on glue for holding together as it does not have the mechanical strength of a dovetail and is particularly strong when used with quality wood glue. It is ideal for box constructions and is suitable for use with natural woods such as pine and mahogany or even manmade boards such as plywood and MDF. 020 3474 0092 or e-mail us at questions and we'll be happy to help.